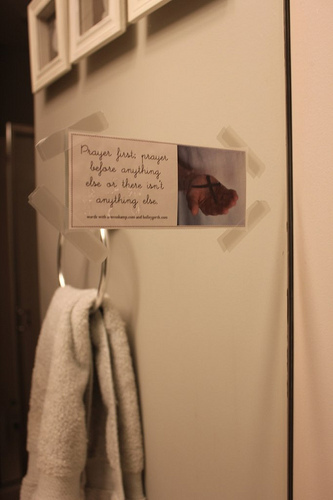 Love this verse taped to my mirror from Ann Voskamp and Holly Gerth. Such a great reminder! Looking in my shower, it looks like I might be a shampoo hoarder. Don’t ask why there were two empty bottles of shampoo/body wash at the bottom of our shower. Ah! No link up today?? Whoops! Not sure how it disappeared, but I think I fixed it! Thanks for sharing, Crystal! I have three bathrooms and even though I only needed to do one, I felt extra-energized and just did all three. And it’s so nice having them so squeaky clean. I am so thankful that you started this challenge. I’ve been following along, and my house has been clean all week as a result. I think the entire family has appreciated it, actually. I did my windows today and just a general cleanup so we can enjoy the weekend! I’m absolutely loving the accountability that’s come with this challenge, I feel so accomplished every day! Saline rinse for my sinuses… it’s made a world of difference since my ENT had me start using it! Or maybe a glass pitcher with a lid? I love those saline rinses when my sinuses are stuffy! What about a pretty decanter like people use for whiskey or whatever? Tap water is not safe for saline rinses. At the very least use previously boiled water, which kills any parasitic amoeba. 2 people have died from it. Was also told by our EENT to NEVER use tap water. Either boiled for 5 minutes or distilled. Oh, that makes sense. I do that when I have a cold or sinus infection. Works wonders! My husband and I were just discussing guests not cleaning up after themselves. We are very conscious to pick up before we leave anywhere (even restaurants). My brother on the other hand may have missed this lesson from our childhood…Good thing we truly enjoy having his family over! I’m trying to have a better attitude, viewing it through the lens of hospitality, but when everyone wants to spend time at my house because “it’s so clean and organized and homey” then leave it a mess, that’s a challenge. It’s just…I spend a lot of time making my house “clean and organized and homey”, you know? Anyway, something to work on. I sadly didn’t clean today but I got some freezer cooking done at least! Hey, something is better than nothing! You might be able to find a smaller bottle that you could fill from the “big jug” so a small nicer looking bottle could stay out? Reuse an empty glass olive oil bottle if you want something free. Buy a nice tall thin bottle if you want something pretty. 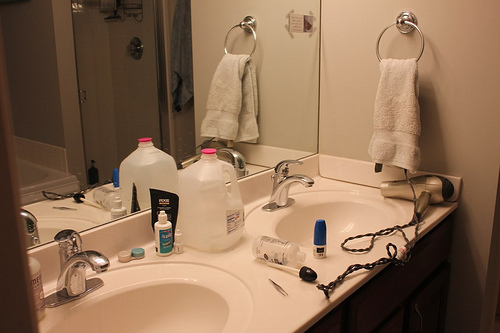 Put the jug under the counter if you don’t want more stuff in your bathroom. I’m thinking possibly I could make room underneath the bathroom sink for it… hmm, maybe if I rearrange stuff I can make it work. Thanks for all the suggestions, everyone! Maybe a drink dispenser with a spigot? That’s what I use in our laundry room instead of ugly detergent bottles. I worked on the kitchen and living room again today. It was a fast job at least since we just cleaned in those rooms on monday but they can always use a vacuum and sweep. I also cleaned all the windows on the inside. I have been cleaning the windows in each room as I have went along so I just needed to do the windows in the basement. I like that my house looks so nice and clean. Glad the conference is going good. I did my living room today. I was glad it was pretty clean and all I need to do was pick up and worry about the floor! It wasn’t even that dusty since my daughter dusts once a week as her chore and it was still looking pretty good. Besides cleaning my desk area, I also spent time outside clearing leaves and trimming my rose bushes! I cleaned all of our windows on the inside, plus tidied and wiped down the kitchen and our living rooms again today! I clean the bathrooms every day out of habit just because it’s one place I like having squeaky clean at all times. This challenge has been such awesome accountability– thank you so much for heading it up Crystal! I have loved reading everyone’s updates! Everyone is doing such a great job! You have cabinets there. What if you just set the jug inside the front of one of the cabinets. Is it really any more work to just put it in there than to put it back on the counter? Glad you’re enjoying the conference. No, I just have to make the room for it. 🙂 Our bathroom is short on storage space, so the cupboard storage space holds all the towels, wash clothes, hand towels, plus trash can, etc. I bet if I were creative I could make it work, though! Just thinking if you did a DIY project for the towels the jug could fit where the towels are currently. A peg or dowel towel rack to hang on the wall with 4 or 5 hooks. Also a straight rod or straight double rod would hold 2 towels and two hand towels. Or a nice basket with the wash clothes rolled and you can just pull one as you need it. I did the living room today, I didn’t finish it up so tomorrow I’ll vacuum it and do the detail dusting that I skipped out on today. Instead I cooked a bunch of stuff and made a wonderful pie for dessert! I mopped the bathroom floors today with my shark steamer and put about 5 drops of eucalyptus essential oil on the top of the mop pad. The smell was wonderful as the steam came out. Made my whole house smell fantastic. I finally did my bathroom today, caught the laundry up, and surface cleaned the dining room. 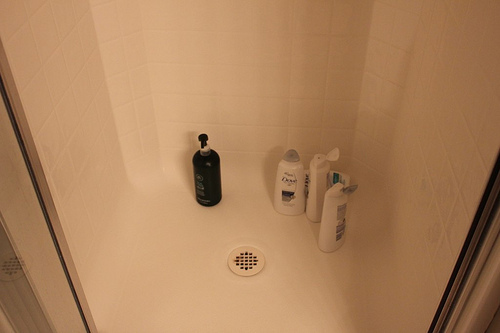 Crystal, I have the same shower. How do you keep it so clean? Mine is covered in soap scum. Thanks. I wondered the same thing. Plus, we have hard water which makes it stain. Any suggestions would be appreciated! My best tip is to try Mr. Clean Erasers. Those are the only thing that successful get stubborn scum off for me. We have fiberglass tub/showers and I use a microfiber cloth on them every week. It will take a few weeks to get the scum off but after that it is just a good wipe down each week. Ours have never been cleaner than they are now just using microfiber and water. Please don’t take this the wrong way, I don’t mean it to be critical at all. I’m just wondering how this house cleaning challenge, the waking up early challenge, and some of the other month-long events you have had really fit in with your mission statement. Can you help me? The tag line of MSM reads, “Helping You to Be a Better Home Economist”, which I think is excellent. That’s why I started coming to MSM and still get the most from. However, challenges like this one are GREAT at helping me to be a better home manager, but not specifically a better home economist. Unfortunately, there are other blogs already doing the home management thing really well. Crystal and co., you folks do the home ECONOMIST thing awesomely – I say keep it up! I have gained a few tips from the comments sections of these posts on some frugal tips, but I just don’t get how waking up early and cleaning my shower are helping me to better manage my family’s finances. Maybe a blog subheader revamp is in order? But to briefly answer your question: the thing that I’ve found in blogging over the last few years is that people need help with getting their life organized so that they can do life and finances on purpose. It’s hard to find time to cut your grocery bill when you are just barely surviving in the rat race of life. I want to help people not just shave some money off their grocery bill, but to completely revamp their life from the inside out so that they can restore their passion and purpose for life. Aha! Well, that makes more sense. I’m at one of those stages of my life where these sessions aren’t practical for my family right now. I do enjoy reading them, skimming the replies, and seeing your immaculately clean house. ( : I’m looking forward to hearing more about your book: I’m all about restoring passion and His purpose for my life! Well Crystal, I think you’ve hit the nail right on the head. For me, and maybe this is not the case for everyone, the key to being successful in different areas of life is to find a balance between everything. And personally, waking up early allows me to have more time to devote to my family and myself which gives me a clearer mind and drive to save more money and manage my finances better. The same with a clean house/shower or whatever. A cluttered house leads to a cluttered mind for me, and that prohibits me from being the best person that I can be and provide for my family in the most economical way. Doing these challenges is a way for us to become better people along with the support and encouragement of others like us. 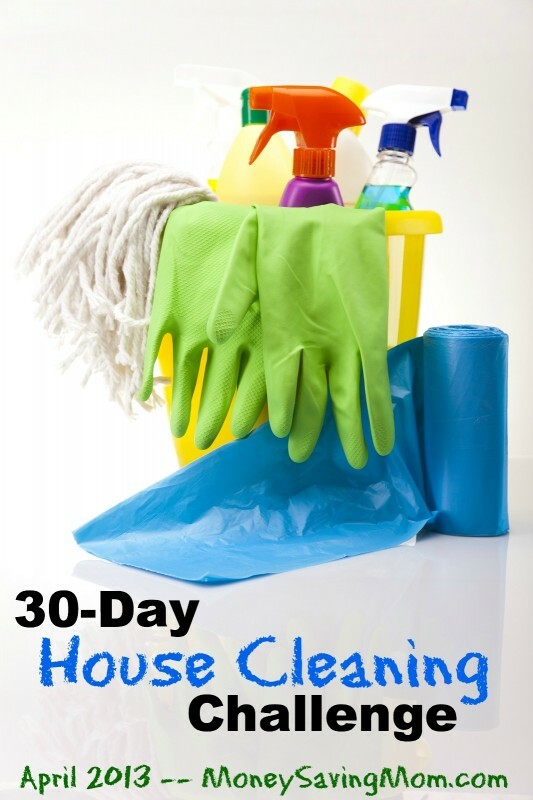 Instead of being overwhelmed by getting up early and having an entire cluttered house to clean everything is broken down into more manageable tasks and we can all see what others are going through. And lastly, I think it’s great to have home management and finances all tied together into one blog. I only have to go to one place! I truly appreciate what you are doing, Crystal. Keep it up! If this were Facebook, I’d be hitting the like button here! That’s one of the biggest things I’ve learned from you, Crystal, is that all of life has to be in order – it can’t be compartmentalized. This challenge has included a major war on clutter for our family. Among other things, I found a rather high value rebate that had expired, and my husband found a check from a friend (He sold him some sporting equipment) for more than 100.00! Not to mention all the things I’ve had to run out and purchase because I couldn’t find them. With the boys’ rooms clean I now have enough soccer shin guards to outfit the whole team! Don’t get me wrong-I’m embarrassed that things are in this state, and I’m sure we aren’t typical. Just wanted to say that there is Definitely a relationship between a clean mind, a clean house, and a clean bank account! Now that the house isn’t making me want to cry I feel like I can meal plan and clean out the coupon drawer! I can’t WAIT to hear about your new book! I just want to chime in and say that I love that you do both types of posts. I am seeing real progress in my home after just one week. I am not a natural homemaker and I often feel bad that it doesn’t come easily to me. I am going to use this printable going forward. (even after the challenge is over) I am a convert in the project a day. It is working! Maybe the definition has changed in the 20 years (oy!) I’ve been out of school, but the Home Economics classes that we took in school included all sorts of different home management, child care, cooking, sewing (let’s not relive that experience! ), and basic money management. Love that definition! Thank you so much for sharing! How about something like this for your counter? Pretty and functional. I have also seen them at Target. Maybe you could put your saline into a smaller, cute squeeze bottle! For the saline…maybe you could buy one of those pretty glass drink dispensers (the one’s with the spout on the bottom…usually used for iced tea or lemonade at parties). There are some really nice ones out there and it might look really neat 🙂 Maybe with a nice ribbon/bow around the top? So glad I found you and your blog…I need a touch (ok, a bunch) of your organization and your frugality in my life. A friend tipped your site at sverve.com. So glad she did! You’d be an asset to our community if you’d like to join us: http://sverve.com. Happy weekend to you! Why not pour your water into a decorative decanter or pitcher with lid? Looks far better than a jug on the counter and still remains functional and decorative at the same time. I do the saline rinse, too–it’s great!! I keep my water bottle in the kitchen because if I pour it directly from the bottle, it’s so cold it hurts my nose. The water is in the kitchen, so I pour the required amount in a measuring cup, zap it in the microwave for 7-10 seconds (which I think they even recommend in the directions), then take it to the bathroom, where the little bottle and saline packets are (on a shelf in a cabinet, out of the way.). It works for me, it’s more comfortable for my nose, and if you have a more space in the kitchen than the bathroom (or a corner nook or something), its really not in the way. Also, did your doctor tell you to do it twice a day? After I had sinus surgery, my ENT is the one who told me to do the saline rinse, but he specifically told me to only do once a day–he said twice was too much. But your doctor might have said differently. Thank you for sharing your system for the saline rinse… very helpful to hear about someone who has it down pat! I’ve been doing the saline rinse for maybe 6 months now and still feel like I don’t have a good system for it! Crystal, your shower floor is so white! How do you keep it so clean? 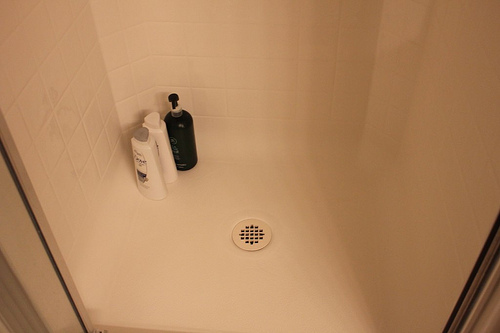 When we moved into our house, the shower floor was already stained and I’ve tried so many things to get it to look whiter…bleach, scrubbing with scouring powders, letting oxi cleaner sit on it for several hours…and it’s still ugly and looks dirty. Gratefully, it was in great shape when we moved here. My best advice? Mr. Clean Erasers. You might go through a few pads to get the thing cleaned the first time, but they have never failed me. I’ve come in a bit late but I’m excited about catching up. I was actually following a friend and didn’t realize that she was following you until today. I can’t wait to have a moment to sit and look through your site more. It seems like just what I need to help cut our families budget in half over the next few months. Thanks for such a great site and for challenging us all to get our homes organized! hey crystal, love you!! !lol love the empty bottles in the bottom of the shower, happens to me from time to time(or a lot)..with three bathrooms and seven kids everytime i clean i wonder..is it that hard to throw them out…haha so glad you always keep it real!!! I’ve been behind all week, but finally got caught up and had time to blog about it, too! 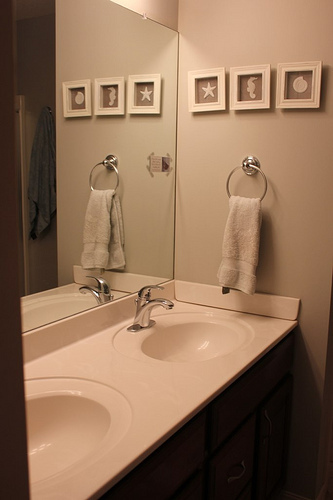 Day 6 – Our bathrooms were pretty clean since I had just cleaned them a few days ago. They just needed a quick wipe down; however, I decided to try the “Dawn & Vinegar” cleaning solution I had seen on Pinterest. It worked great – even better than the bleach-based cleaner I had used a few days ago. Wow! Got so much done this weekend. I’m not sure what feels better, blowing those dust bunnies a kiss good-bye, or the empty space that is showing up from de-cluttering during this process Mmmm….I LOVE empty shelves! Crystal, thank you so much for this challenge, our home was in desperate need! Can I ask what the quote says. I can’t read it. I didn’t have a lot of time because my husband and I were getting to go away Friday to Sat. to a B&B. I chose to refresh the kitchen counters and vacuum the living room. My windows are desperate for cleaning but I knew I didn’t even have time to tackle it. But it felt awesome leaving with a clean kitchen and living room! Now I have a question: is that handwritten or computer generated? It looks so perfect! We also do the saline rinse here – and I also hated having the jug on the counter. We are saving all our extra money to pay off our mortgage so I didn’t have any extra play money right now to buy something cute to use, so I made my own. I used an empty orange juice container. One of the cute plastic ones that the lid screws on- like a carafe. I just soaked the label off and now it sits on the counter as less of an eye sore. Hope that helps! Crystal, hope to join you and others on the challenge, though I’m just tuning in. My bathrooms are all done with the help of my daughter and a friend. Well, except for some redecorating in my grandson / company one ( read toy story shower curtain and accessories )! I am unable to do the physical cleaning much so I put in fresh rugs and towels and made Big Eddie’s rigatoni ( courtesy of Gooseberry Patch Christmas 2012 cookbook). This lasagne like casserole exceeded my expectations. Anyway cleaning as a group and having dinner together was great fun. Perhaps some other readers might want to pair up with someone and work on each others houses together. And about that jug. I hate to say it but I just use regular tap water for mine and have had no problems. But what about under the sink? If your quote or Bible verse is on card stock, you could punch a small hole in it and hang it by a small suction cup with a metal hook. I got a pack of several at Joann’s craft store near the magnets for about $2. They are what you might hang a child’s sun catcher craft with. It would hold enough for at least a week I think (a 2 cup container), look pretty, & you wouldnt have to worry about filling it up too often. I know this is really off topic but I just saw the picture of the bathroom sink don’t you just love the netti pot! (well technically not pot I can’t think of the name) my husband introduced me while I was preg. with our daughter. By the way LOVE your blog! Looks great! I love how clutter-free your home is…I’m sure it makes for easier clean-up. I hope to work towards that during this challenge! Also, you asked for suggestions for your gallon jug? Would one of those pretty glass drink dispensers work? I’ve seen them at Home Goods, but I’m sure they have them at many places. Something like this, maybe? $20 at Bed, Bath, and Beyond…not bad!